Rohrs Farms is a multi-generational family farm, currently in our sixth generation. We are located in West Central Ohio in the small town of McGuffey. This area is known as the “Scioto Marsh”, an area with flat, black high organic soils that are well suited for grain, forages, and vegetable production. 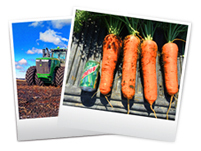 We grow grain corn, corn silage, soybeans, processing carrots, and we also do custom farming. Our corn predominately goes for the production of ethanol for Guardian in Lima, Ohio and ground for dairy feed. Our corn silage goes to feed cows at the largest dairy in Ohio. Our soybeans are ground and made into bean meal and bean oil by ADM and Cargill. We continue to be one of the largest carrot producers in Ohio, supplying Campbell’s Soup and other vegetable processors. We have a very diverse land base, currently farming in seven counties in West Central and Northwest Ohio. We have year-round experienced staff of ten plus full time employees, some of whom are involved in day to day management at Rohrs Farms. We also employ many additional seasonal employees during busy planting and fall harvest seasons. We are a very progressive, technologically focused, and data driven operation. We take pride in continually educating ourselves and our staff by attending multiple educational seminars each year to push Rohrs Farms to be the best operation it can be.